Some Tea Party supporters grumble, but Christie has a strong reservoir of support at Conservative Political Action Conference outside Washington, DC. 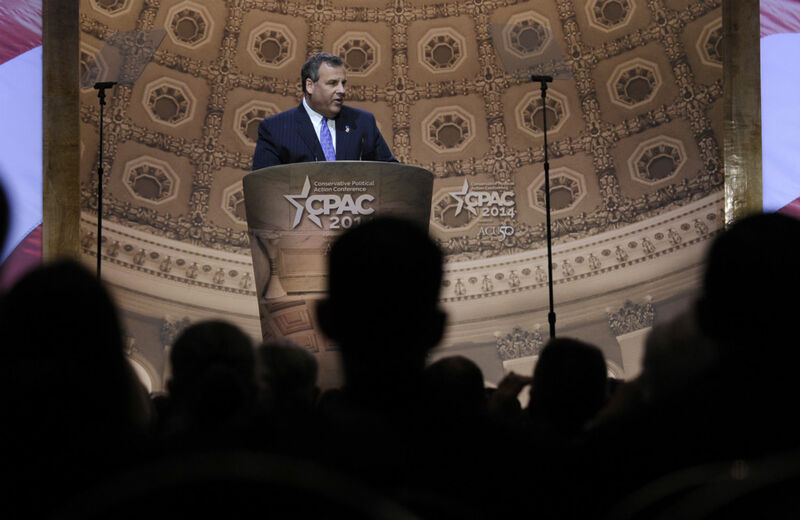 The hard-right audience at the Conservative Political Action Conference (CPAC) was expected to give Chris Christie, the governor of New Jersey and not exactly the Tea Party’s friend, a cool reception on Thursday. After all, in 2013 Christie wasn’t even invited to CPAC, and he’s earned a reputation as the establishment’s candidate, not the ally of the insurgent conservatives who fill CPAC’s ranks. Besides, outside in the hall his critics were evident, including John Bloom, a right-wing activist from Newport News, Virginia, holding a sign that read: “Walkout protest of Gov. Traffic Jam,” and who called Christie a “big-government Republican.” And, only that morning, The Washington Post ran a poll saying that 30 percent of Republican voters and 35 percent of conservatives wouldn’t consider voting for him. But, confounding expectations, Christie entered the hall—to address a gathering of perhaps 1,500 to 2,000 people, by Christie Watch’s rough count—to rousing applause, whoops and hollers and a lengthy standing ovation. Other presidential contenders who spoke today, including Texas Senator Ted Cruz, Louisiana Governor Bobby Jindal and Florida Senator Marco Rubio, were welcomed warmly, but it did appear that the beleaguered New Jersey governor was the star of the show. Perhaps it was because, as some attendees explained to Christie Watch, they thought Christie is being treated unfairly by Democrats and by the media. Or perhaps they identified with Christie’s bullying, tough-guy image, as others said. But whatever it was, Christie bathed in the applause, and he launched into a spirited account of his past efforts in New Jersey to confront unions, slash public pensions and take on teachers and other public employees. We don’t get to govern if we don’t win. And they [the Democrats] do. Let’s come out of this conference resolved to win elections again. In any case, Christie did indeed get a stirring reception, and if a couple of dozen interviews means anything, there’s a reservoir of support for him among at least half or more of the attendees at a hard-core conservative conference. Not something Republicans are likely to hear from Chris Christie anytime soon.